With “The Rematch” of the 2015 NBA Finals finally upon us tonight, we in the Harvard Sports Analysis Collective wanted to take a look at the upcoming series á la old Grantland shootarounds (RIP), using a predominantly statistical lens. These topics include: The viability of Kyrie Irving, Draymond’s cold shooting, the importance of three-point shooting efficiency, assessing the Warriors’ odds to go back-to-back, and exploring whether the history gives the Cavs an edge. Enjoy! Clearly, Kyrie Irving and Kevin Love are the two members of the Big Three that are weak links on the defensive end. In a recent article, Zach Lowe noted that the Cavs have allowed 1.207 points per possession when Love and Irving defended pick and rolls, and that weakness should only be exacerbated by the Warriors’ juggernaut. Something needs to change. Many have suggested Channing Frye should play over Kevin Love. But I’m here to ask, why not Kyrie? Kyrie Irving is bad at defense. This regular season, for example, he ranked 83rd out of 85 qualifying point guards in Defensive Real Plus-Minus. There are many defensive statistics out there, and DRPM isn’t necessarily the gospel, but you still probably don’t want to be 83rd out of 85. In fairness to Kyrie, though, he was rehabbing an injured knee this year, and he finished 37th last year, well below—but not egregiously below—the league average. Furthermore, anecdotally, he was playing well defensively in Game 1 of last year’s Finals before his injury. So can we give him the benefit of the doubt? Can he flip the switch and be magically good at defense? How has he been in this year’s Playoffs, when it’s mattered more? That is a list of every four man unit Cleveland has played for over 70 minutes this postseason, ranked by defensive rating. The top of the list features a lot of Shumpert and Dellavedova and not a lot of Kyrie (also not a lot of Love, but we’re focusing on Kyrie here). However, if we zero in even further on the Kyrie vs. Delly debate with a little help from our friends at NBAwowy, we find that in the 102 postseason minutes that LeBron and Delly have been on the court with Kyrie on the bench, opponents are scoring just 0.788 points per possession and shooting just 32% from three-point range, compared to 1.02 points per possession and 34.6% from three with Delly off and Kyrie on. These statistics are perhaps skewed by Kyrie playing against starters and Delly playing against benches, but that almost certainly does not account for such a dramatic difference. Dellavedova has always been a better defender than Kyrie, and has continued to be better in the Playoffs, and will undoubtedly be better at slowing down Steph Curry. The question remains then, is Kyrie’s offense good enough to make none of this matter? He’s averaging 24 points and 5 assists in the Playoffs—surely you don’t just bench a guy like that? For all his impressive drives and 25-plus point games, however, Kyrie isn’t moving the needle much on offense for the Cavs. When LeBron and Kyrie have shared the court this postseason, Cleveland has scored 1.14 points per possession; when Kyrie goes off, they score 1.13. Additionally, it is realistic to expect the Cavs to move to a more LeBron-centric offense against the Warriors and increase his 28% usage rate to something closer to the 40% usage rate he had in last year’s Finals, which he nearly won by himself. Should that happen, the fact that Dellavedova shot 46% on catch-and-shoot threes this year and Kyrie shot just 35% is another nail in Irving’s coffin. Don’t take this the wrong way. Kyrie Irving is a very good offensive player and has been integral in Cleveland’s postseason strategy of blowing opponents out offensively and not relying on defense. But it’s time to start worrying. The Golden State Warriors are not the Toronto Raptors. And if Kyrie were to give some of his 36 minutes per game to Dellavedova, the Cavs would be better off. Whatever zone that Draymond is in during his Beats advertisement, he sure wasn’t in it during the OKC series. Between the lack of scoring, loose play with the ball, and unusually dirty play (even for Green), it was a series that the former Michigan State Spartan has to put behind him. One particular thing that plagued Green throughout the series (besides his Rockette-like kicks), was his ice-cold performance from three, shooting 5-for-24 from beyond the arc. Most notably, on three-pointers with a defender between 4-to-6 feet away from him—which NBA.com defines as “open,” but not “wide open”—Draymond went 2-for-15. This is a small sample, and it’s possible that with Durant often on Green, the former MVP’s height disrupted Draymond’s rhythm. But even so, Draymond’s ability to force the defense to respect his three-point shooting is a key part of the Warriors’ spacing scheme on offense, and Draymond wasn’t able to hit his open shots. In the below highlight from Game 3, Kevin Durant has to decide whether to stay with Draymond as he comes up from the corner or help on the Iguodala drive after Adams switches onto him. Durant decides to stay and help, and Waiters decides to stay on Ian Clark rather than leave to cover the open man, the combination of which leaves Draymond with a wide-open three . But he misses, leaving three Thunder players (including Durant) under the basket to gobble up the rebound. Similarly, in this highlight, Kevin Durant is forced to help on a potential Barnes’ cut to the basket to prevent a layup. That, coupled with a Curry screen, frees up Green by just enough to prevent a KD contest before hitting his only trey in five attempts in a pivotal Game 7. This one he hits to give the Dubs a double-digit lead late in the fourth. This was the kind of play that was killer for Golden State this year, but with Draymond not feeling it during the series, he was not able to capitalize on the approximately three open threes he saw each game. Given how Believeland played Green last year, it’s likely that he’ll have several of these opportunities each game. In last season’s six-game series with the Cavaliers, Green took an average of 3.2 three-pointers each game, 2.7 of which were with the closest defender at least six feet away. Draymond only hit 18.8 percent of these treys, a pretty abysmal number over the course of an entire series. For comparison’s sake, Marcus Smart—who perhaps had the worst three-point shooting season of all-time—shot 25.6 percent from deep when the closest defender was at least six feet away this season this year. The Cavs and Thunder series were aberrations from Green’s usual performance from downtown. This regular season, he hit 39 percent of his threes with a defender at least four feet away from him. In perhaps the two biggest series of his career, however, the former Izzo project has gone 9-for-38 from three with a defender at least four feet away, a measly shooting percentage of 23.6 percent. If Draymond can step up in the Finals and hit his normal 40 percent from beyond the arc, it not only puts up points on the board that could potentially swing a game, but it could force Love, Frye, or LBJ to stay tighter on Green and could open up space down low for the Dubs. During last year’s Finals, Green was making less than $1 million per year. Now, he’s in the first year of a five-year, $82 million player. In the biggest moment of his career, it’s time to see if he plays like it. Will “The Rematch” Follow the 3-Point Trend of the 2015 NBA Finals? Last year, when HSAC published a “stat-around” after Game 5 of the Finals, I wrote about the one box score statistic (besides points) that coincided with the winner of each game of the series: three-point shooting percentage. Sure enough, the trend continued in the decisive Game 6, in which the Warriors outperformed the Cavaliers from 3-point range, with Golden State shooting 38.2% (13-for-34) compared to Cleveland’s 23.1% (6-for-26). As I explored in that blog post, efficiency from downtown and winning were strongly correlated in the 2015 Finals. With “The Rematch” upon us, I am curious to see if the team that shoots a better percentage from beyond the arc will once again win each game of the Championship. There is a little bit to go off of in addition to last year’s final with respect to this inquiry. First of all, we can look at the two regular season matchups between these rivals during the current season. On Christmas, the two teams met at Oracle Arena, and even without Stephen Curry, Golden State managed to beat Cleveland 89-83, beating them with efficiency by outshooting them 27.8% (5-for-18) to 16.7% (5-for-30) from beyond the three-point line. Three weeks later—with a healthy Curry (7-for-12 from three and 35 points)—in Cleveland, the Dubs dominated the Cavs 132-98, while winning the 3-point battle 47.5% (19-for-40) to 36.8% (7-for-19). Additionally, there was evidence of this pattern exhibited in the Conference Finals by both the Warriors (in their 7-game, nail-biting series over the Thunder) and the Cavaliers (in their 6-game battle over the Toronto Raptors). As seen below, the team that shot a better percentage from downtown won 12 of the 13 games in the NBA 2016 Conference Finals (with the one counterexample in red), while the team with more three-point makes in a game only went 6-6 (and one game was a “tie” in three-point makes). Again, shooting more three-pointers or even making more 3s was nowhere near as deterministic in these games (or last year’s Warriors-Cavaliers Finals) as was 3-point shooting percentage. Both teams will get their opportunities beyond the arc; but tonight—and the rest of the series—is about which team converts them at a better clip. Past performance is not always indicative of future results, but it sure is a good foundation to build on and a solid basis to form predictive insights. In analyzing this year’s NBA Finals, I decided to run a basic regularized logistic regression in order to determine the probability of each team winning the series. The predictors of the regression were each team’s season-long summary statistics, from assists to FG% allowed to margin of victory to attendance (using all three tables of statistics from the Basketball Reference league summary page, with 134 different predictors in total). Then, these statistics for both the home team (i.e., the team with home-court advantage) and the away team were used as predictors to determine whether the team with home-court advantage would win the series. Moreover, each predictor was standardized for each year, so that all statistics were considered relative to the league average and spread of the statistic during that year. While this model is fairly basic and considers no interactions, I believe that it is a relatively good baseline. I then trained the model on data from every playoff series since the 3-point line was introduced in the 1979-1980 season. Naturally, the most important covariates included SRS, margin of victory, pythagorean wins, and shooting stats like true shooting percentage. Interestingly, the model also found the home-court advantage team’s attendance to be a relatively important predictor. Overall, the model’s accuracy in choosing a given playoff series is around 74%. After training on 1979-2015, I predicted the results for each of this year’s Playoff series thus far. The model correctly predicted 11/14 of the series, missing only the Clippers-Blazers series (which was heavily affected by Clippers injury woes), the Thunder-Spurs series (which included three games determined by 5 points or fewer), and the Raptors-Heat series, in which the model gave the Heat a 52.3% chance of winning the series (of course, the series would end with the Raptors holding on to win game 7). When predicting this year’s NBA Finals, the model gives the Warriors a 74% chance to repeat as champs, which is only slightly below the probability given by ESPN’s BPI and just a few percentage points above the probability given by FiveThirtyEight’s Carm-ELO ratings. So it seems that there are decent odds that the Warriors will raise another banner in the Bay. But they can’t get ahead of themselves: the same model gave the Spurs a similar 68.7% chance of beating the Thunder, to whom they lost in 6 games in the conference finals, which goes to show that anything can happen, even in the upset-resistant NBA playoffs. From a statistical standpoint, previous champions have historically performed much better in the Finals than previous runner-ups, with previous champs winning 28.2% of NBA Finals since 1977 and previous runner-ups only winning 17.9% of the time. Previous champs are also much more likely to reach the Finals, with 16 champions returning to the NBA Finals but only 9 runner-ups. 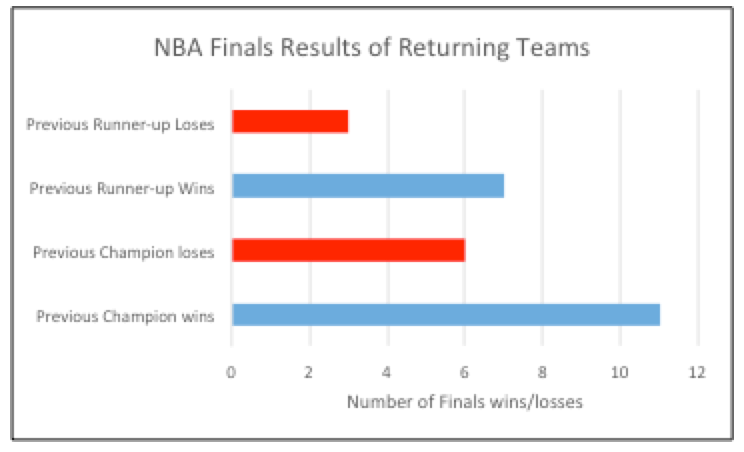 This difference may be due to a greater chance of consistency among championship teams, as the winning Finals team usually tends to maintain and/or resign all of its star players for the next year. And accordingly, the losing team may want to make changes in order to become more competitive the following year, which can impact performance either positively or negatively. This year’s NBA Finals is unique because both the previous runner-up and previous champion are returning to the NBA Finals, which has only happened 4 times since 1977. In those series, the previous champion has won once (’98 Bulls), and the previous runner-up has won three times (’83 and ’85 Lakers, ’14 Spurs). While four is an incredibly small sample size, this seems compelling enough to at least be an ESPN statistic. So can LeBron finally bring that Championship to Cleveland? Maybe, but history does not completely help his case. Should the Celtics Trade the No. 3 Pick for Okafor?